Before this project, [David]’s office had a fairly terrible system to tell everyone who was in the office, who was out, and who wasn’t coming in today. Velcro and whiteboards will do the job, but arcade buttons and LEDs called to [David], leading him to create this In/Out Status Board. The old system consisted of a whiteboard on the side of each partition, with velcroed labels indicating if a particular person was in the office today, out, sick, or on holiday. Inconvenient to change, and there was no single place everyone could look to see if a particular person was in or not. 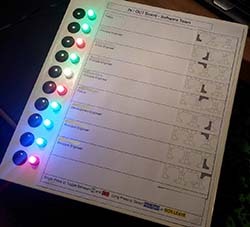 The new system consists of a four-person pod with four arcade buttons and WS2811 LEDs, an Arduino Nano, and a 433 MHz radio. The main panel is just a bigger version of the four-person pod, keeping track of everyone in the office. A single button switch will change a person from being in to being out, with longer presses necessary for ‘sick’ and ‘vacation’. It’s interesting to note what’s not included in this build: A fingerprint scanner was out of the question, because that would effectively eliminate anyone ever being marked as ‘sick’. An RFID tag reader was out for the same reason. Also not included is a display. That’s just fine, really – [David] won’t be changing the labels very often, anyway, and that would just add to the cost and complexity of the project. [MrBuildIt] has lived up to his name when it comes to this year’s Christmas decorations. He built a rig that spreads Christmas cheer from one end of the cubicles to the other. In the demo video after the break you’ll see that the system is controlled by a nicely polished Android app. It lets you choose from three different Christmas songs (or no music at all) as Santa Claus makes his rounds. The app includes buttons for switching all of the lights on or off but we think it’s more corny fun to see then turn on as Santa flies overhead. The sleigh and three tiny reindeer are suspended from a pulley system. When they make it to one end of the office a hall effect sensor serves as a limiting switch. From the look of it you’d think Santa will be flying backwards on the return trip but there is a servo that flips the thing around so that he’s going the right way. This is quite a gaunlet to have thrown down when it comes to office decor. We’d like to see what geeky thing’s you’ve been doing with your own decorations. Get some details up on the web and send a link our way!